OBV2 series surge protector is suitable for TT, IT, TN-S, TN-C-S etc. power supply system of AC50/60Hz, 380V, installed on the joint of LPZ0 or LPZ1 and LPZ2 zone, which peotects the electric network not shocked by the thunder and lightning. It's designed according to GB18802.1, IEC6 1643-1. 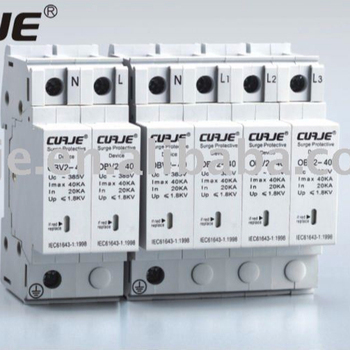 It adopts 35mm standard rail, there is a failure release mounted on the module of surge protector. When the SPD fails in breakdown for over-heat and over-current, the failure release will help electric device separate from the power system and give the indication signal, green means normal, red means abnormal.